Though computer aided design (CAD) has taken over the major part of the architectural and engineering workload in this century, there is still plenty of room for old style paper and pencil drafting. Drafting, whether freehand or technical in natural, requires an incredible amount of skill as well as the best tools you can get your hands on. The tools that draftsman, designers, architects and engineers rely on most are drafting pencils, which is the instrument that takes what is inside the user’s head and allows them to communicate it to others. Getting your fingertips on the best drafting pencils can be overwhelming given the wide variety of choices available. You can narrow down your search by making use of our buyer’s guide to get a better handle on the various features to look for when selecting drafting pencils. Once you are armed with this information, you can make use of our drafting pencils reviews in order to compare how each manufacturer implements various features into the design of their model. By being well-informed and making comparisons of what models are available on the market, you can be prepared to make a well-qualified decision when it comes time to purchase the best drafting pencils to suit your needs and preferences. Why do you need drafting pencils? If you are already a draftsman, architect, engineer or designer, you already know the answer to this question. If you are a student who is learning to utilize drafting in one of the many trades or professions that require it, you need to understand that your drafting pencils are the most important tool in your kit along with your square. What benefits can you expect from drafting pencils? A quality drafting pencil can help you communicate the design details in your head on a sheet of paper so that others can understand and create the vision that you have. From a drafting pencil you can create intricate details with crisp thin lines or bold layouts demonstrating what your finished work will look like. All of the elements of your vision are dependent upon various aspects and features of the drafting pencils you use. What are some features to look for in drafting pencils? • 0.2 mm to 0.4 mm. This extra-fine point is most often used in detail drawings and fine writing is small spaces. These leads are very brittle and will break easily if you apply too much pressure while using them. • 0.5 mm to 0.7 mm. Those who exert heavier pressure while drawing sometimes opt for these sizes of lead. These leads are not quite as good for clarity and precision in smaller, finer details, but they are the most common size used in mechanical drafting pencils. • 0.9 mm and up. Bolder writing, sketches and thicker lines on drawings often require these thicker leads. In addition, some draftsmen prefer these thicker leads in a lead holder, which they sharpen to various levels of fineness for different types of drawing and writing needs. These lead sizes tend to last longer and don’t break as often. Drafting pencils only accommodate one size of lead, most draftsmen will purchase a set of pencils with a broad range of lead sizes to accommodate all of the various requirements. These sets are often color coded in some way for quicker size recognition. • Diameter. A wider grip is most often preferred by those who have larger hands or who simply prefer a thicker feel to the instrument. Another consideration for a wider grip is related to those who have difficulty gripping smaller items due to health conditions like RSI or arthritis. Users with smaller hands are typically more comfortable with a grip of smaller diameter. • Material. The most common types of grip materials are plastic, metal, silicone and rubber. They can also come in combination. Rubber and silicone grips have a squishy or pillowy feel to them. Metal and plastic grips are usually scored in some way to prevent them from slipping during use. The weighty feel of a metal grip is often preferred because of their longevity and because they tend to remain cool to the touch. Next to lead size, grip is one of the most important deciding factors when it comes to choosing the drafting pencil that best suits you. Because drafting pencil sets can be a pretty significant investment, getting pencils with plenty of longevity becomes an important feature as well. Consequently, pencils with metal barrels throughout or with metal in the cone and top of the pencil tend to be top choices. Pencils with metal mechanisms with greater durability and ease of function are also preferred because they do not break down as quickly. • Lead Colors. Many draftsmen place red lead in separate pencils to use for “redlining” drawings or pointing out corrections and blue lead for writing notes or creating guidelines that will not show up in blueprint processing. • Lead Advancement. Advancing lead is something that you will be doing often. Find a style with which you are comfortable among push button, shaker, twist, bend or knocker, and automatic mechanisms. • Retractable Tip. This feature protects the fine metal tip that holds the lead in your pencil. Being able to retract it can be a selling point to some. • Dual Clutch. A dual clutch continues to hold the lead which is being used in place while moving the next lead into the barrel behind it. This prevents wasting lead and provides for continuous feeding of lead while you work. • Auto Lead Rotation. A new type of technology designed to keep the tip of your lead sharp while you work to provide greater precision. The features we have discussed should have you already considering exactly what you are looking for while considering your drafting pencil purchase. The reviews that follow should be a great way to compare how these features are implemented in the design of the various models in order to narrow down your buying decision further. 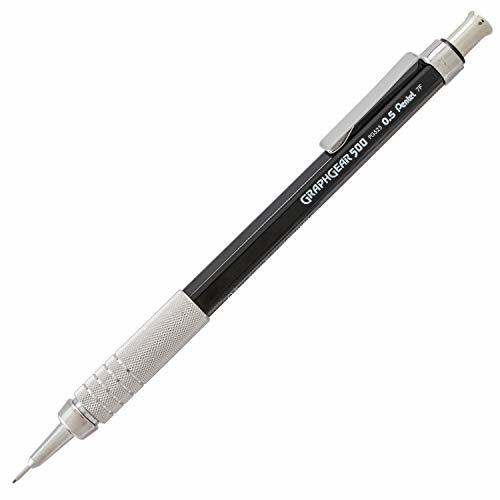 The Pentel Graph Gear 500 Automatic Drafting Pencil is a fixed sleeve 4mm drafting pencil which uses 0.5 mm lead for larger template work and common drafting. It has a metallic-mesh grip on a plastic body and utilizes automatic lead advancement and comes with an eraser in the top. • This is a well-balanced pencil with durable construction. • The metal-mesh grip has a cooler feel and sure grip between your fingers. • It uses one of the most common and versatile size of drafting leads (0.5 mm). • It does not come with tip retraction. • Automatic lead advancement is fastidious to some users. You are looking for a stable, well-balanced and durable pencil with a cool touch. You might not like the automatic lead advancement feature. The Rotring 800 Lead Holder Clutch Knock System is an older style of drafting pencil most often referred to as a lead holder rather than a mechanical pencil. This style of pencil utilizes 2 mm lead which is sharpened periodically to various point widths. It comes with a metal knurled grip on a metal brass barrel with gold accents and comes with push button lead advancement. • The advantage to this style of drafting pencil is that you do not break lead as often. • There is no need to change to a different pencil whenever you move to a different drawing or lettering function. • This pencil is constructed with a brass barrel and includes a metal knurled grip for a cooler touch while working long hours. • Breaking the sleeve of this pencil is less likely making it safe to place it in your pocket. • This style of pencil requires a sharpener (not included). • You have to be mindful of the sharpness of the point on your lead while you work. • You can buy entire sets of pencils for the same price as this single pencil. You want an all-in-one pencil with plenty of durability and longevity. Keeping this pencil sharpened to the right point and price-tag might not be for everybody. Fine design work can’t be accomplished with a more elegant and stylish pencil than the Pentel Graph Gear 1000 Automatic Drafting Pencil. This is a high-end pencil for professional use with a 0.3 mm lead for fine detail work, fine writing and intricate drawing. It includes a metal barrel and grip with inlaid soft latex-free pads. Lead advancement is automatic and it comes with a removable pocket clip as well as a retractable tip. • The grip on this pencil is going to feel better in your hand than just about any other you can get your fingers on. • The retractable tip feature is certainly a positive. • Its attractive design and metal barrel combine to create a pencil that is both durable and elegant. • The removable clip is an added feature that is hardly ever seen on other pencils of its class. • In a set, these pencils are color coded for various sizes of leads. • Automatic lead advancement can be a little bit irksome to some users. • The eraser that is included is really small. • This is one of the least often used lead sizes because it is so brittle. You require a durable and dependable pencil for template and fine detail work. You might not be overly pleased with the automatic lead advancement feature and brittleness of the lead. Some draftsmen are impressed by the rOtring 1904444 600 Mechanical Pencil and for good reason. 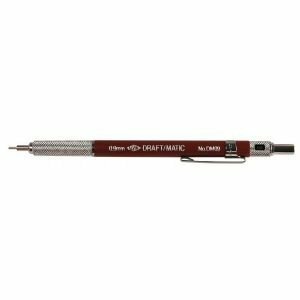 This pencil comes with a durable full metal body for better balance and a metal knurled grip for a cooler touch during those long hours of work. The 0.7 mm lead used in this pencil is a little bit heavier so you aren’t breaking lead as often. It has a brass mechanism for longevity and lead is advanced using a push button style. • This is a durable, well-balanced pencil with plenty of longevity built into its metal body and brass mechanism. • Its hexagonal shape keeps it from rolling on your drafting table. • It uses push button lead advancement. • A two year limited warranty is included with this pencil. • 0.7 mm lead is a little bit too heavy for smaller detail drawings. • It does not have a retractable tip. • It is a bit pricey for a single pencil. You want a very durable pencil with all of the best features and balance you can get and don’t mind paying a little bit more to get it. When it comes to finer detail work, this pencil is not going to do the job. The same fine design and drafting work that you get from a single Pentel Graph Gear Automatic Drafting Pencil can be had in a package of five pencils. All five pencils come with a metal barrel and the same metal grip with inlaid soft latex pads, the same removable pocket clip, the same lead hardness indicator and the same retractable tip. The package comes with pencils that accommodate five common lead sizes for various drawing, lettering and drafting functions including: 0.3 mm, 0.4 mm, 0.5, mm, 0.7 mm and 0.9 mm leads. • The grip on these pencils are going to feel better in your hand than just about any other pencil you can get your fingers on. • Their attractive design and metal barrel combine to create pencils that are both durable and elegant. • This is a set with all of the lead sizes you are likely to need and they come color coded for easy selection while you are working. You require a durable and dependable set of pencils and want them to perform a wide range of functions. You might not be overly pleased with the automatic lead advancement feature. 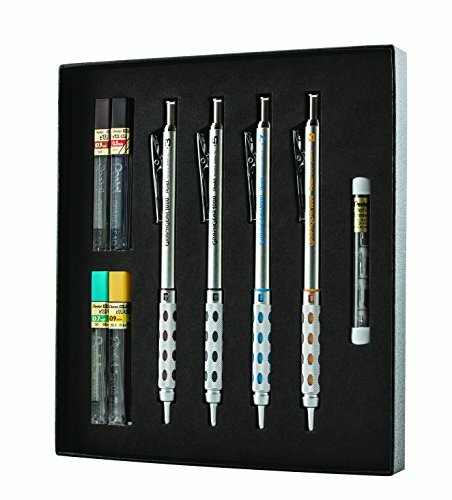 This Pentel Arts GraphGear 1000 Premium Gift Set PG1000BXSET is the perfect gift for a graduating designer, architect or engineer, but you can also give the gift of this quality set to yourself if you like. It comes with all of the leads, erasers and pencils that any draftsman might need. These pencils come with the same features as the pencils we just reviewed above, but leave out the 0.4 mm size pencil and utilize a dual-action, push-button retractor instead of automatic lead advancement. • This is a durable set of pencils with plenty of longevity built into its elegant design. • They have the best cool to the touch grip you can get your fingertips on and are well balanced. • Their dual-action retractor helps to protect the tips and leads while also preventing it from scratching or damaging other objects. • The set comes with 0.3 mm, 0.5 mm, 0.7 mm, and 0.9 mm lead size pencils as well as lead and eraser refills. • The different sizes are color coded for quick selection while you work. • There is a stress point in the lead advancement mechanism which threatens the longevity of these pencils. • Refilling leads can be something of a challenge with these pencils. You need a durable and long-lasting set of pencils for a wide variety of functions in one convenient pack. Refilling issues might not be something that you want to deal with. One of the most trusted names in lead holders presents the Staedtler Mars Drafting Mechanical Pencils 4 pk, 925WP4. This set comes with a 0.3 mm, 0.5 mm, 0.7 mm and 0.9 mm pencils in order to help you complete a wide variety of drafting, lettering and drawing tasks. These pencils feature push-button lead advancement in a high-quality plastic barrel. They feature scored rubber grips, a chrome-plated, metal pocket clips and hardened aluminum tips. Along with this set of pencils come lead refills as well. • You get a broad variety of lead sizes for the various tasks you might encounter with this set. • The set comes with lead refills. • The scored rubber grips on these pencils are longer to accommodate various styles of gripping. • This is an affordable way to get started with decent quality drafting pencils. • The plastic barrels and rubber grips on these pencils is not quite up to long-term professional standards. • The lead advancement mechanism in these pencils has a little bit of play in them. 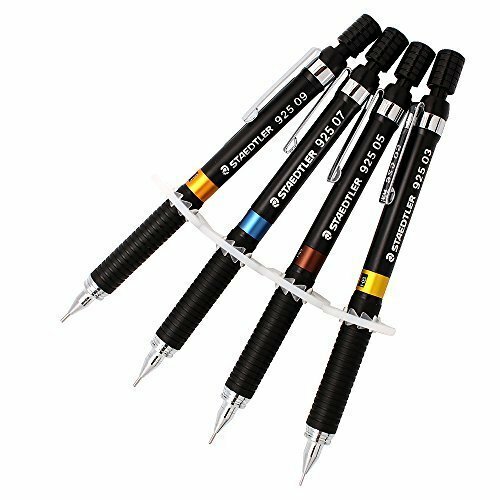 • These are not typical of Staedtler Mars quality. You need a solid starter pack from a well-reputed manufacturer to get you by until you can afford a higher quality set of pencils. Do not expect these pencils to perform up to the standard of higher grade Staedtler Mars lead holders. This 6 Pack Draft/Matic Mech Pencil by Alvin is meant to keep you in drafting pencils over the long-haul. You get six quality built pencils with 0.7 mm lead and a very well-functioning, push-button lead advancement mechanism. The grips on these pencils is made of knurled stainless steel and you also get built in stainless steel pocket clips to carry them wherever you might need them. • These are durable, well-balanced pencils with a great deal of life in them. • They have a cool to the touch metal grip. • The push-button lead advancement mechanism is well designed for longevity. • They work well for those who need a little heavier, all-purpose size of lead. • The fact that all six are 0.7 mm lead size is disappointing. • This set is pricy, especially given that there is only a single lead size. You want to buy all of the drafting pencils you will ever need in one package. The problem with this set is that you will probably need other sizes of pencils, but you have already blown all of your money. Students who simply don’t have the means to get into a higher-end drafting pencil will appreciate these Pilot H-325 Drafting Mechanical Pencils. 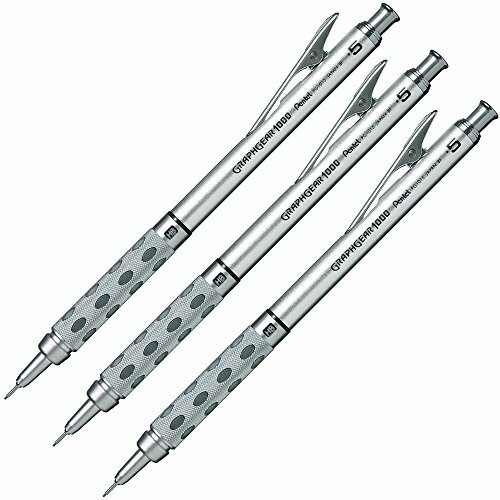 This set of three affordable drafting pencils might not come with all of the style and elegance of those professional pencils, but they do include the functionality and will get you through until you can afford the others. These pencils have a plastic barrel with a longer scored grip to accommodate different styles of grips. 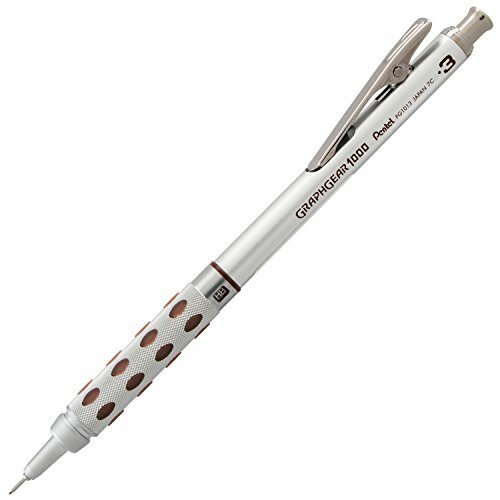 They utilize push-button lead advancement and are essentially a disposable drafting pencil. • This set provides you with three disposable drafting pencils at an affordable price. • Push-button lead advancement makes them easy to use. • The longer scored grip accommodates various styles of gripping. • There is no need to worry about refilling. • These pencils are neither durable nor elegant in their design. • They only come in the 0.5 mm size, so if you need thicker or thinner lines, you will have to buy another set. You are on a very tight budget and simply need functional drafting pencils to get you by. If you expect them to perform like the other professional grade pencils, you will be very disappointed.